Pretty laid back weekend. To wet to go anywhere really. The rain is good for the farmers though I suppose. My weekend pretty much consisted of going through my music collection and burning a heap of CDs to my hard drive and copying them to my iPod. But I did re-discover some old music, as well as grabbed a heap of stuff I have on vinyl in digital form. I also bid on a heap of cheap CDs on ebay. Also played a shitload of Luxor2 on my Xbox360. It's like a breakout clone but a million times better and more addictive. OK, so my page has been re-arranged and made more readable and "user friendly". I've added some cool things like my LAST.FM player, so you can listen to the music I listen to! I've also got a Skype Button so you can see if I'm available for a chat. I'm eventually going to rearrange FunkyJ.com and update it with my latest interviews as soon as I can. That takes a little more work as the CMS and Word don't play well together, and I've got to convert all my word docs to text, then cut and paste, then format them all... Yes, icky I know! I'm thinking of changing to a whole new CMS, so if you've got any suggestions post them in the comments! Remember that story about those horrible animal activists who wanted to have that mega cute little polar bear called Knut put down? The cute little fella was even in the Colbert (or should that be Colbear?) Report! Well, the whole story is a fiction. A lie*. 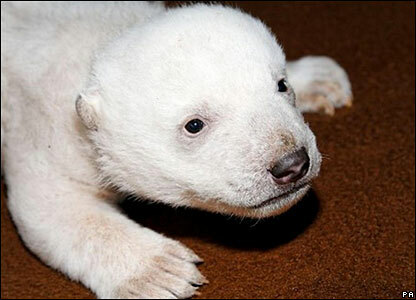 There's a bear called Knut, and that's about the extent of the "truth" behind this story. Thank the world for mediawatch! But I just wanted to bring this up to say that journalists never do their jobs correctly. I know the reasons for this - lack of funds, lack of time, publishing deadlines - but I don't CARE about them. In any other industry, if something similar happened, the people who took this story as truth and reported it from the AP feed would all be sacked. Yet I'm betting in 90% of newspapers and websites you won't even see a correction, let alone an apology to all involved. It's utterly disgusting that these people go about their lives, after ruining the lives of others, without any feelings of guilt or remorse after reporting a story so badly. The media has totally screwed this up, and are unapologetic about it, and it makes me so angry! Please, to all my readers, all 3 of you, can you link to this post, to the mediawatch page, blog about it, email about it, just spread the word about this, and get the media to admit their mistake and apologise to the men whose lives have been threatened with violence because of this poorly researched story.